The lightweight app (it weighs just 4MB) lets you get a swift readout of all the important specs of your machine. Firing up the app will give you detailed statistics on all the individual pieces of hardware in your computer, including CPU, motherboard, RAM, graphics cards, hard disks, optical drives and attached USB devices. It can also check how many memory slots your computer has and what memory’s already installed, so you know if there’s room for more RAM and what what type you need to buy. 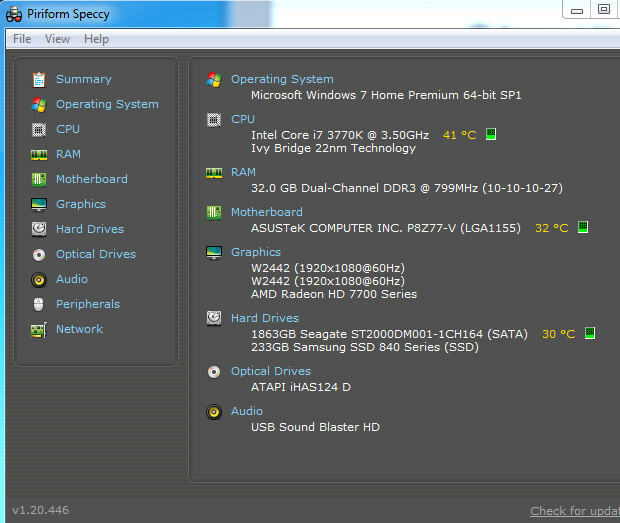 Speccy also displays the temperatures of different components, making it easy to track down any overheating parts. If the app could also include a list of all the programs installed on a machine, it would be just about perfect. The program is free and available to download from here. Yeah, it’s good, but it’s a pain that you have to download anything at all to do this. Ideally this should be a single click somewhere in windows. Still I got my lappie second hand, so it’s good to know the exact specs.